This Thematics project builds on the notion of ‘pharmakon’ as coined by the contemporary philosopher Bernard Stiegler. In ancient Greece, ‘pharmakon’ was understood both as ‘poison’ and ‘medicine’, and in some cases also as ‘scapegoat’. The word might mean either the one or the other depending on the context, which implies a certain knowledge, or ‘knowledge-ability’. A skill of dosage and use, witchcraft involving insight and imaginative contextualization. At the ‘Pharmakon: whitch culture?’ conference, a group of artists and theorists will investigate the notion of ‘pharmakon’ in our society. As Stiegler suggests in his analysis of the need for a ‘pharmacology’ to counter the poisonous fumes of economic, ethical and cultural impoverishment, it is clear that the fabrication of our culture(s) has urgently to be (re)questioned. What are the categories we use to produce and develop the culture in which we ‘individuate’ ourselves? What is the change in ‘technics’ that is needed to re-imagine our desires, stepping out of ourselves, as ex-isting in the public sphere? What sort of witchcraft is demanded from us, as artists, citizens and thinkers, to come up with the right spells and potions, and to dose our practices to transform poison into medicine. The ‘Pharmakon: whitch culture’ conference is part of the Thematics two-month research residency project, organized by Bains Connective, which brings together artists and theorists to work on, share and perform their concerns on this matter. They experiment on developing artistic remedies and toxic fumes, in search of a reformulation of the agency of the artist in contemporary society. In this way the Pharmakon project inserts itself into a growing movement of artistic initiatives that engage more directly in the political sphere, that want to make the public, the other, the citizen, part of their researches, that question how the artistic relates to the world we live in. These artistic interests speak of the willingness to restate desire in its fullness as a societal driving force. A desire that is not reduced to economic drives, but that is structured and transformed in accordance with the practices and thoughts of its members. Or more simply: we speak about set-ups that could inform and produce knowledge, and which could question the drives and urgencies that produce our social agencies. Participants in the Thematics residency: Alexandre Le Petit, Flora Pilet, Sophie Quénon, Lilia Mestre, Elke Van Campenhout, Joséphine de Weck, Michiel Vandevelde, Michiel Reynaert, Veridiana Zurita, et al. ‘Pharmakon: whitch culture?’, was a Thematics artistic research residency project, taking place in Brussels from the 15th of October until the 15th of December 2014. This residency is one of the stages in the development of the broader, transnational ‘Pharmakon’ research project undertaken by Institut Nomade. 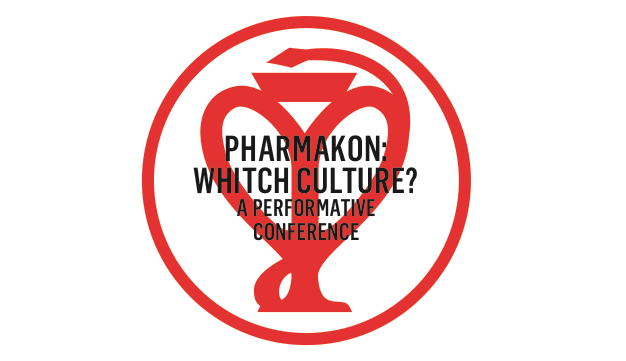 The ‘Pharmakon: whitch culture?’ conference will last three days and will explore the theoretical and artistic approaches to dealing with an increasingly toxic economic, ethical and cultural environment, in search of other techniques by which to connect, share and imagine the fabric of our togetherness. As a ‘performative conference’, this meeting involves artists as well as theorists, dissolves the boundaries between ‘specialists’ and ‘public’, and between ‘performers’ and ‘theorists’, and opens up a space for desire and reflection. Thematics was organized by Bains Connective, in collaboration with Institut Nomade, the a.pass research center and Kaaitheater. Thematics is a two-month residency program for artists and theoreticians, curated by Lilia Mestre within the framework of Bains Connective. Every time the residency addressed another topic, deemed to be urgent or relevant for the current state of (artistic) affairs. During this period, different artists and thinkers share their works, strategies and ideas. The work space Bains Connective creates the initial context and set-up, and offers work spaces and a communal starting point by inviting artists, theoreticians, academics, politicians and activists to add and contribute to the research. As a basis for the exchange, we organize weekly meetings as well as two public encounters, where the participating artists can share their work in a format of their choice. Starting from these basic principles, we work closely together on developing ways to share interests and processes of work. Thematics develops for each residency project a strategy of questioning and interviews that follow up and register the artistic processes so as to create a written publication that reflects every Thematics residency. These publications are also a working tool that expresses to necessity to communicate, to speak out, to share the practices, methodologies and artistic trajectories with each other and a larger public. The activities of the Institut Nomade are fundamentally trans-disciplinary in nature. Concerned with how the notion of “performativity” resonates in both artistic practices and cultural constructions, the Institut conducts research into the ontology of performative language, the relationship between the performer/author and the stage, and the stage itself as a scene of collective individuation and thus a form of micro-politics. The global project of the Institut could be described as an inquiry into “modern culture”, that mobilizes the conceptual tools provided by the performative arts, the heritage of J.L Austin’s concept of performativity, and Bernard Stiegler’s contemporary elaboration of the idea of the “pharmakon”. The Institut is concerned with all forms of writing that compose our public voice– forms that we create by and for ourselves. This research takes on a variety of formats including interviews, performances, texts, images, videos, installations, soundscapes, etc. The interaction between these media is organized by rhizomatic systems of writing and by experimental loops of representation that participants are invited to appropriate and reconstruct. a.pass is an artistic research environment that develops research on performativity and scenography, in an international artistic and educational context. a.pass offers a one-year artistic research training program at post-master level for artists and theoreticians, based on the principles of self-organization, collaboration and transdisciplinarity. a.pass participants develop an independent artistic research project, with a personalized curriculum in a shared and collectively created research environment. artistic research. a.pass emphasizes the relation between the research practices and a broader societal field, and encourages engaged transdisciplinary practices. In the context of its artistic research center, a.pass offers a tailor-made PhD trajectory for doctoral students that gives the possibility to develop the practice-based part of their PhD research in collective research environment. The Kaaitheater is a Brussels and international arts centre which has been a leader in theatre, dance, music and performance for over thirty five years. A number of artists and companies have been closely associated with the Kaaitheater for many years: Anne Teresa De Keersmaeker & Rosas, Jan Decorte, Jan Lauwers & Needcompany, Meg Stuart & Damaged Goods, Ictus, tg STAN and Tristero, and from abroad Jérôme Bel, Raimund Hoghe, Toneelgroep Amsterdam, Jonathan Burrows, The Wooster Group and others. From 2013 to 2016 Eleanor Bauer, Kris Verdonck, Mette Ingvartsen and Ivo Dimchev are our artists in residence. Social and ecological topics are a prominent element in Kaaitheater’s work. The Kaaitheater is part of two European networks: Imagine 2020, that focuses on art and climate change, and House on Fire, supporting productions that are intended to contribute to a critical debate on political and social issues. The Kaaitheater presents about 75 productions each season and welcomes its visitors to two locations in the canal zone in Brussels: the Kaaitheater itself (the large theatre, on Sainctelettesquare) and the Kaaistudio’s (small theatre and rehearsal studios, near Dansaertstraat).